Tucked along Fulton Street on the east side of the City, the Horse Inn has been a local restaurant since 1920. In fact, it’s the longest continuously running restaurant in the City, a detail which made the telling of its relationship with the longest continuously running public market in the Country a natural fit for our first in the Stories of Market series. Matt Russell and his wife, Starla, own the Horse Inn, a Lancaster staple that offers delicious, seasonally focused meals and one-of-a-kind cocktails in a cozy environment. It is a special place where local reigns and inspires dishes on a daily basis. “It’s a lot of the just straight connection with the farmers and the producers. That’s very important to me, what we do, and what the Horse Inn does,” he said. 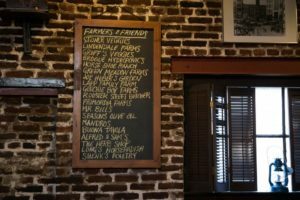 And those relationships are celebrated on the chalkboard hanging on the back wall of the Horse Inn dining room, many of which are Lancaster Central Market Standholders. Matt remembers coming to Market as a kid, but his relationship with the 1889 Market House quickly blossomed when he began working in a local kitchen. With passion and connection like that, it was not surprising that Matt was able to reveal such a unique memory from his time spent here at Market. It was story enough to make any Market-lover swoon. Perfectly put, Matt. Thank you. And thank you, Market friends, for coming along with us on this journey as we share Market stories from members within the Lancaster Community! Tune in next Wednesday for our next Stories of Market installment.